What other modes did train commuters use in their journey to work? Following on from my last post about public transport multi-modality in the journey to work, this post takes a more detailed look at what modes were used in conjunction with trains in journeys to work. This chart shows that ‘walking only’ (ie no modes other than ‘train’ specified) was the most common response for people who used trains in four of the five cities, with Perth the notable exception. Perth’s rail network includes two heavily patronised lines that are largely within freeway corridors, with longer than traditional station spacing and much smaller walking catchments for each station. Perth train commuters were therefore much more likely to involve other modes of transport in their journey to work. Private (motorised) vehicle transport was more common than other modes of public transport in Brisbane, but the other cities were fairly evenly balanced between private vehicle transport and other public transport modes. Perth had the highest share of train commuters reporting also using buses (almost a third), suggesting the train feeder bus networks are working quite well. Sydney had a similar rate of other public transport mode use to other cities, despite limited multi-modal fare integration, although Sydney did have the highest reported rate of ‘walking only’ for train commuters. Melbourne had the second highest rate of other public transport modes being involved, with roughly equal amounts of bus and tram. What modes are used to access train stations? (note that train does not appear as this analysis looks at the mode preceding the first use of train). Some recently published PTV data on use of train stations also allows analysis of estimated access mode splits for 7am-7pm weekday train station entries based on origin-destination surveys of journeys of any purpose. The data sets aren’t in strong agreement about ‘walking only’ and private vehicle use, although they all have different measurement frames. The disparity may support the suggestion that there is under-reporting of rail-feeder modes other than walking in the census – particularly vehicle driver/passenger (see also an earlier post that found people living beyond reasonable walking distance of train stations reporting train and walking only to get to work). On the other hand, it may also be that train-based journeys to work have lower rates of private vehicle use than for other journey purposes. 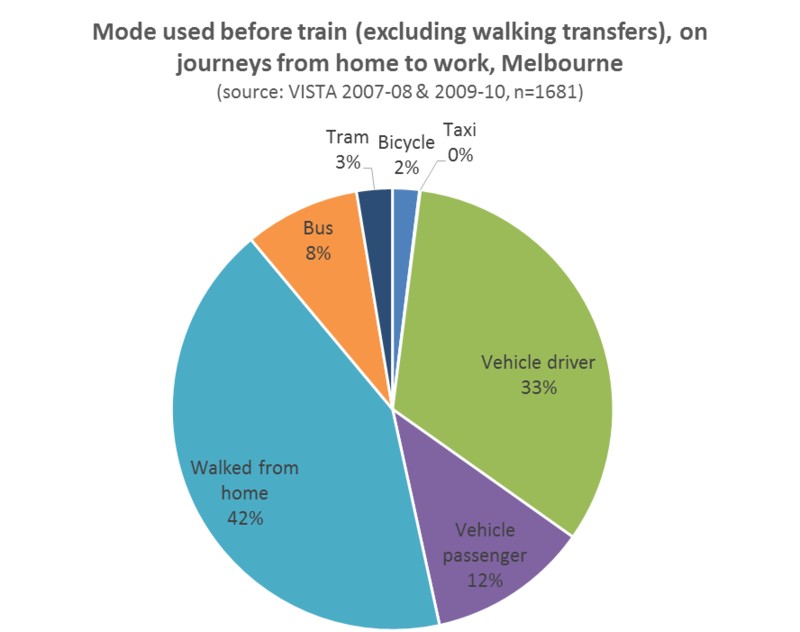 All the figures also suggest that trams are much more likely to be used after trains in the journey to work in Melbourne, which makes sense, as there are only a few tram lines in suburban Melbourne that feed the rail network, and trams provide comprehensive street-based transport within the inner city area helping to distribute people who arrive by train. 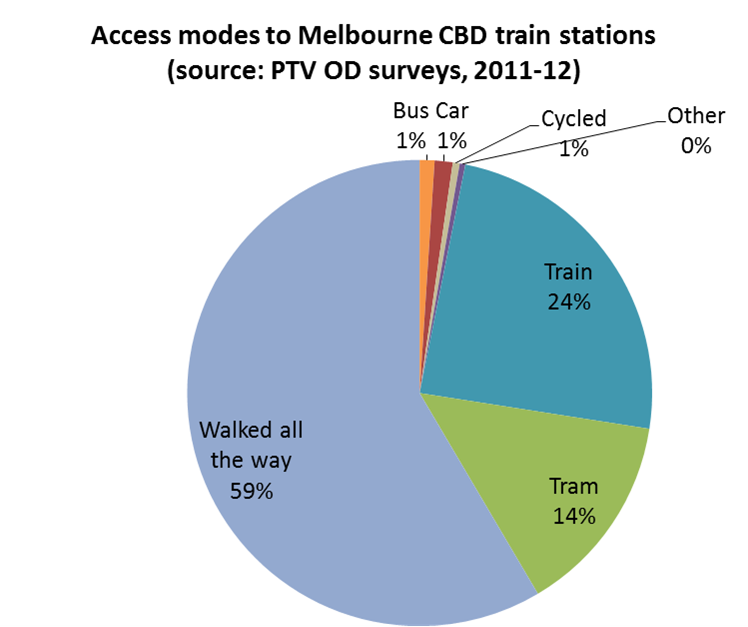 The data shows walking as the dominant access mode, but also a quite large number of train-train transfers at CBD stations. You can see for Perth that the ‘walking only’ share dropped in favour of most other modes (following opening of the Mandurah rail line). Brisbane also had a notable shift away from ‘walking only’, particularly to the use of other public transport modes, which might reflect continued changes in travel habits following full multi-modal fare integration in 2004-05. However Brisbane retained the rate of use of other public transport modes in journeys involving train of all cities. Adelaide had a decline in buses being part of train-based journeys to work, but an increase in trams and private vehicle drivers. Melbourne saw an increase in bus use with train journeys, with a decline in all other modes and ‘walking only’. Sydney saw small increases in ‘walking only’ and bus use for people making journeys to work involving trains. In terms of bicycles being part of train-based journeys, Melbourne had the biggest increase (from 1.0% to 1.2% of journeys involving trains), while Adelaide went backwards (1.6% to 1.0%, although I have no idea if this might have been weather related). Anyone reporting taxi I have counted as private vehicle passenger. 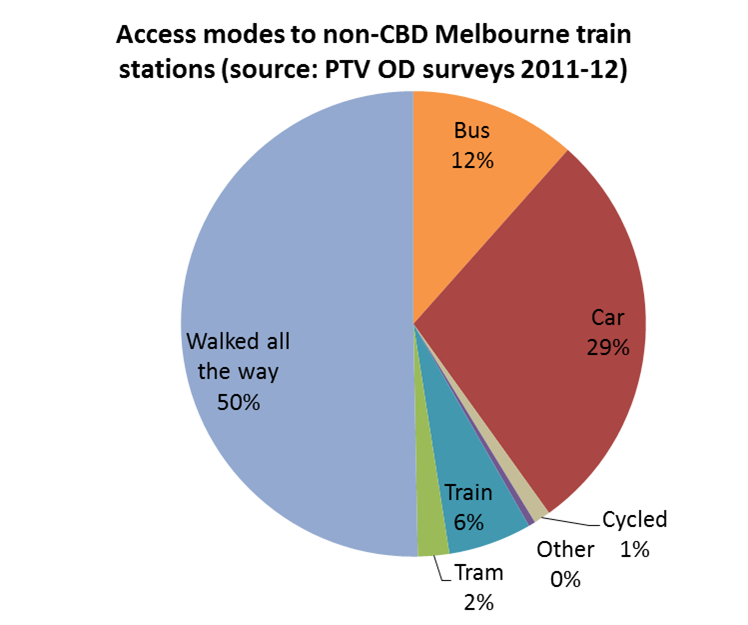 For more information on other modes used with trains in Melbourne see pages 26-27 of the PTV Network Development Plan for Metropolitan Rail, and recently published PTV data for use of train stations, including access modes. This entry was posted on Sunday, June 23rd, 2013 at 8:01 pm and is filed under Australian Cities, Melbourne, Multi-modal. You can follow any responses to this entry through the RSS 2.0 feed. You can leave a response, or trackback from your own site. One Response to What other modes did train commuters use in their journey to work? Thanks Chris. Once again very intereting analysis. Brisbane will probably revert back to 2006 levels for feeder bus when the Council review is implemented which removes feeder buses in rail corridors.